Matthew Booker, Johnathan Shepherd and Patrick Marshall in ‘Rent’ at Cocoa Village Playhouse. Cocoa Village Playhouse turned 25 this season. Over the years, it has grown in stature and now is a producer of consistently fine, traditional musicals. 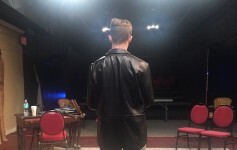 It has taken occasional tentative leaps in its vision for those musicals, especially “West Side Story,” “La Cage aux Folles” and “Miss Saigon” — the idea appears to test the waters and see what happens with the patronage when something more mature hits the boards. But with its terrific, uninhibited production of “Rent,” which is loaded with themes of HIV/AIDS and homosexuality, CVP catapults beyond those more cautious forays and lands squarely in the lap of bold, grown up theater. Cast of ‘Rent’ at Cocoa Village Playhouse. Less than four months later, it opened on Broadway and ran for more than 12 years with a total of 5,123 performances. It won four Tony Awards, including best musical, best book and best original score. That year, Jonathan Larson won the Pulitzer Prize for Drama. 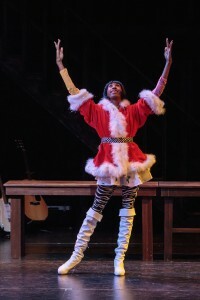 Patrick Marshall as Angel in “Rent” at Cocoa Village Playhouse. 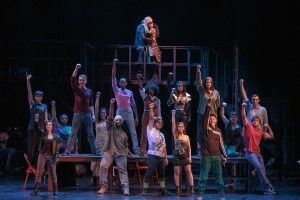 The show is more of a phenomenon than “Hair.” Although equally groundbreaking, “Rent” has amassed legions of groupies around the world who make it their point to as many productions that their car and budget can take them. And on opening night at Cocoa Village Playhouse, the excitement was just as electric as the show’s legend demands. The actors seem to be on a mission to uphold the stature of the show and its themes — love in the face of loss, art in the face of commerce and the marginalization of young artists. Especially powerful in their performances are: Matthew Johnson (wearing a blond wig makes him looks SO much like Kurt Cobain) as the musician Roger; Johnathan Shepherd, wildly winning as the teacher Collins; Patrick Marshall, a dream in the role of Angel, Collins’ beloved; and Kristen Warren, who makes you sit up and take note in her performance of Joanne. Standouts also include Matthew Booker as Mark, the young filmmaker; Morganne Evans as Mimi, a young, directionless woman; and Emily Godfrey as free-loving Maureen. 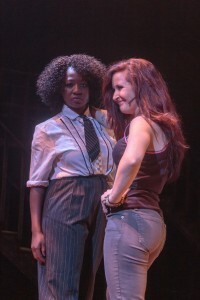 Kristin Warren and Emily Godfrey as Joanne and Maureen in “Rent” at Cocoa Village Playhouse. As artistic director Anastacia Hawkins Smith insists, this is the result of teamwork. Rather than directing, she serves as producer and smoothly paves the way for her creative team to shine. Ian Cook’s lighting and scenic design are moodily provocative. Dan Hill’s costume design is right on grunge with a pop of fabulous for the drag queen “Angel.” Conductor J. Thomas Black, Jr. maintains a pulsating urgency with the hard driving rock score while Gavin Little’s sound design provides that rock ‘n roll Memorex moment throughout. The bold directorial vision, teeming with grit and hormones, is led by the modest Pamela Larson, the Playhouse’s resident choreographer often charged with staging scenes. Here, she lets lose with sexually charged blocking, stage business and a Dionysan dance that will make you wonder if CVP has slipped into another dimension. Oh, don’t delay in seeing this production, because you’ll want to see it again. But it’s only running through Sunday. SIDE O’ GRITS: “Rent” runs through July 5 at Cocoa Village Playhouse. $18 to $32. If you are easily offended by language and adult content, then stay home…or go and have your mind expanded…but do leave the children at home. Call 321-636-5050 or visit CocoaVillagePlayhouse.com.